Your iAM Makes You Different – Dare To Stand Out! An advert seen this week on the trolleys of a major UK grocery store. Our values are what makes us, they are our unique selling point. People subconsciously relate to authenticity. Being yourself is the best way to build relationships. We have all heard terms like ‘play to your strengths’ but are you playing to your distinctive ones? Often when we stand out in some way we try to dampen this down, especially if we feel that this part of us will be judged, soft, weak or a bit non corporate or professional. There are 7.5 billion people on the planet and we are all different. 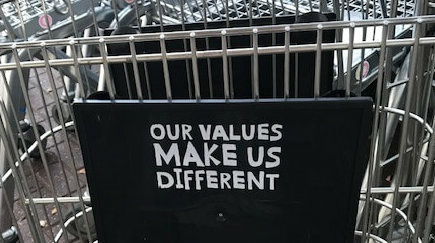 We all have our unique set of values – our iAM Values, that drive our behaviour, give us purpose, motivate us, and impacts on how we feel in certain situations. We expect the world to reflect our values back to us. When we know our values, we have deep self-awareness and understanding of our relationship with the world around us. Research this year has shown that self-awareness can help leaders more than an MBA can. The impact on self-awareness gained by clients with iAM Values is rated by them at 90%. For corporate values to be successful they need to be authentic to the business they represent, more than just words on a bit of paper, and not business bullsh*t . They need to be human. None of us have management speak written on our hearts. What defines you and what defines your business or your team? Are you using business speak or human, normal language? Are you conforming to a ‘corporate standard’ or standing out? The temptation is to change and adapt and conform, what if you decided to go the other way? How would you look, feel and behave differently if you were truly being your values? #BeYourselfAtWork. What would #BeYourselfAtWork look like for you and your team?